I have admitted before that I am a coffee snob. I never drank coffee until our first trip to Italy in the mid-1990’s; I tried an espresso/caffé to try and cure my lingering jet lag and was hooked. Going back to the US after each trip was always a let down as I could never seem to find a caffé that would match what I had in Italy. I eventually bought an espresso machine to satisfy my caffé desires. After living in Italy for almost two years and enjoying the delights of REAL caffé everyday I am struggling during our trip here in the US. To start with, I refuse to go to a Starbucks as they have bastardized coffee here in America. It seems the other coffee shops try to mimic what Starbucks serves and these coffees are not what you will find in Italy. In Italy the key is quality…not quantity! We have gone to several different coffee shops, both independent and franchises and each time I have been left with a bad taste in my mouth, literally and figuratively. I have to be careful to explain I only want a “single” shot of espresso and they look at me like I asked this in Chinese. 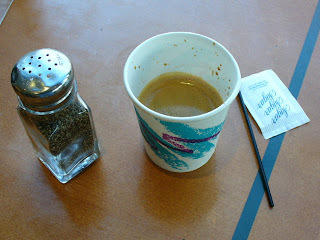 The results vary from black water with no crema to six ounces or more of liquid in a large cup. We did have one place at BWI before our flight to Cleveland when we asked for a caffe macchiato who asked if we were aware that what we ordered was an espresso with just a little milk; God bless the little things in life. Then there is the issue of wanting a macchiato, again I curse Starbucks. I do not want a large cup with foam and caramel syrup, a macchiato by definition is an espresso with a “stain” of milky froth. More than once we have been scooping thick foam out of the cup into the trash to try and get to some coffee. There are a few baristi in Ascoli Piceno I may need to hug when we return home. Brian, are you just talking about coffee shops or restaurants, too? Here in California, I never have a problem getting either espresso or macchiato in restaurants --except for those that don't have an espresso machine. But then, I ran into that in Italy sometimes. Bryan, if you're coming through Pittsburgh on your trip, I can send you to TWO baristas who make REAL Italian coffee! Yes, I know that as a true Browns fans you hate the Pittsburgh Steelers, but the rest of us aren't so bad. Let me know! I really like the Caffe in Naples where the baristas use the machines with the handle to pump up the pressure and make you a delicious caffe of maybe 1/2 to 1 oz in volume. I noticed as you go further North, in Italy, the volume of caffe in the cup is greater and the caffe usually a little weaker. Then you get to the US and even the Italian restaurants run by immigrants from Italy giver you a caffee that has been Americanized, that is even more volume. Brian, that is a long way of saying that I know what you are saying. Hi Brian, while I LOVE Starbucks (I lived in Seattle before Italy) I know what you are saying. In my opinion real coffee is in Italy. Starbucks, while I like it, is totally separate from coffee coffee. Really, it should be considered a distant relative, because it is so different. When my husband and I went to the states he had similar problems finding good espresso. Starbucks had no problem making it for him, but he liked the frapuccinos there better. We were able to find (miraculously) a cafe that served Illy and knew how to pull a great shot. He was in heaven! Brian, you are absolutely correct on this one. I think what makes bloggers so passionate about Starbucks is that it looks like it ought to produce great product and then lets you down. On Jennifer's blogsite "Italian Trivia" there is also a defense posted (not by Jennifer) that it isn't the same thing. I guess we can each decide for ourselves. I have been in Italian restaurants that had their machine break down that day but never in one without a machine. Sometime, if you go to the coast, particularly, Alba Adriatica, try Perche No on Via Duca d'Aosta or Ma Do on the corner of Trieste and Trento. The latter is a very different bar for Italy. In Giulianova try the Bar Las Vegas, the best place in town to watch people. On this trip to the US we are not eating at any Italian or Mexican restaurants (we get real Italian at home and had New Mexican for 20 yrs). We have been trying various cafes and the closest we have found so far is Sheri's in Norwalk, OH. We have been to Pittsburgh even though I do not like the Steelers, my parents are both from that area. I won't go into Starbucks, McDonalds or Walmart. I tried Starbucks before our move and never liked the taste of their coffee. Just a few more days for some real stuff.